GSSSB Recruitment Notification 2018 Declared for 2221 Office Assistant & Clerk Posts. Gujarat Secondary Service Selection Board (GSSSB) published the GSSSB 2221 Clerk & Office Assistant Bharti 2018. 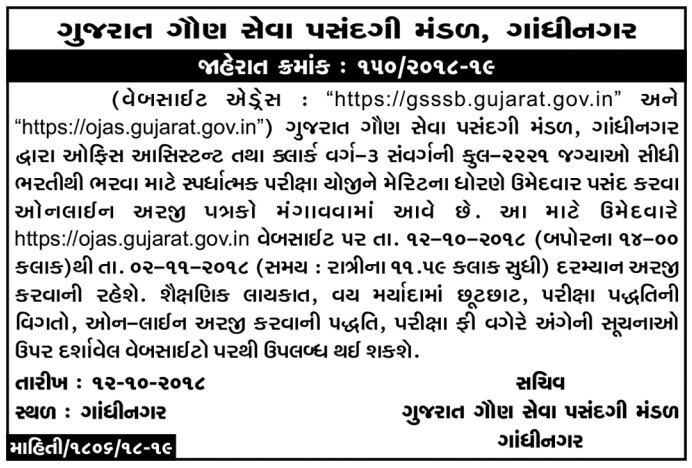 Interested candidates may Apply For Clerk and Office Assistant Posts at ojas.gujarat.gov.in. 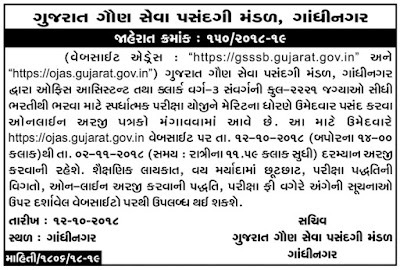 The Gujarat Secondary Service Selection Board published Advertisement No. 150/2018-19 on various Gujarati News Papers Like Gujarat Samachar, Divyabhaskar, Sandesh etc. to Fill up Total 2221 Jobs of Bin Sachivalay Clerk and Office Assistant Vacancy in the department. Eligible candidates may apply online from 12-10-2018 to 02-11-2018. Other information about GSSSB Bharti 2018 such as Eligibility Criteria, Qualification, Age Limit, Age Relaxation, Application Fees, Dates & How to apply is given below in this article. Selection Process: The applicants have to go through the Recruitment Selection Process as under Written Examination Computer Proficiency Test, Verification of Documents/Certificates.